This is another piece from my kinetic ring series. 8 rings made of 1,5mm sterling silver wire and 1 ring made of Gold-filled wire were hammered for a nice texture and then joined together with a slender rectangle made of sterling silver and oxidised to black. It was then wrapped with 24K vermeil exactly above the asymmetrically placed GF ring. 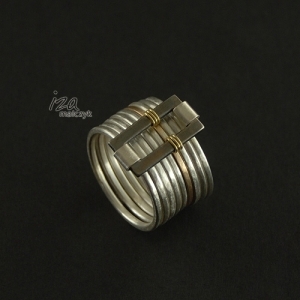 The rectangle element moves around the rings and it makes the ring not only a decorative but also amusing piece of jewelry. Size of the ring: EU from 16 to 20, US from 7.5-9 (19mm of internal diameter).